Did you miss our most recent webinar? You can watch it below! Or, keep scrolling to check out some of the highlights. We were so lucky to have Charitable Marketing Coach, Jenni Hargrove (Nonprofit Jenni), join us for a webinar this week! Nonprofit Jenni sets out to "teach nonprofit organizations across the country how to execute manageable, affordable marketing and development strategies to maximize their positive impact." Q: If I send emails to potential sponsors, rather than make a phone call, do you have tips on making them feel more personal and less like spam? A: I always include a couple sentences at the top of the email that are personalized to the person I'm writing to. For example, "Hi John, My name is Rebecca and I'm reaching out from Charity X. I really loved seeing your company out supporting Race for the Cure last year - I think it's so important for the business community to give back. I know you guys tend to support health-related causes, so I wanted to ask if you would be interested in this opportunity..." Also, if you are emailing potential sponsors, DEFINITELY address the specific person by name - don't just say "Dear Nike..."
Q: We are nonprofit in a very poor area, can we approach larger companies out of area for support? Our sponsor pool is very limited. A: Absolutely! Try to stick within a 100 miles- that is usually the corporate radius that they will look at. Another option is looking through your current donor database for major donors who may want to underwrite part of the event. I also suggest looking at your board members and asking them to make introductions to any businesses they have connections to who may "owe them" favors. Q: Can you advise on approaching larger organizations, they sometimes seem like a lost cause. A: Larger organizations are tricky because it's best to have a contact in them. I always suggest STARTING with organizations you have a direct connection with, either through major donors or board members. However, most of the larger corporations do have an application process right on their website, it only takes about a half hour to apply, even if it is a long shot. Q: Is it good to praise the company a bit when looking for a sponsorship, or just get straight to the point. A: Definitely start by talking about the work they do in the community! That let's them know you have actually researched them, which shows you care enough to do your homework before you just ask them for a bunch of cash. 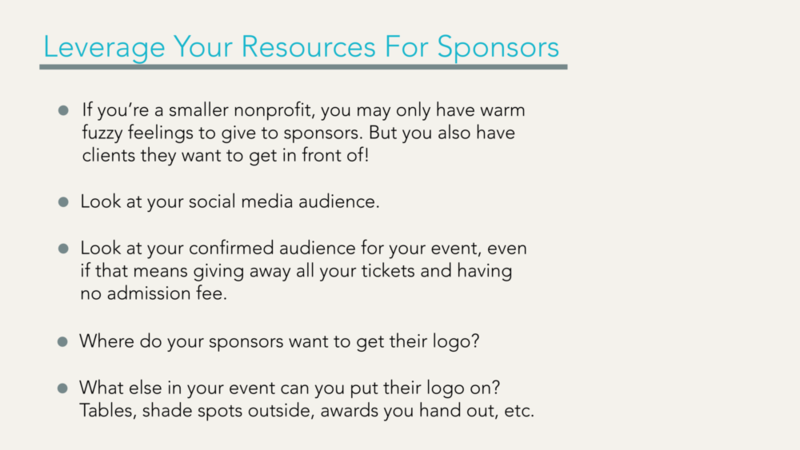 If you have any questions for Nonprofit Jenni, shoot her any email at nonprofitjenni@gmail.com. Or, you can always reach out to the DipJar fundraising experts for help. It's what we love to do!